A GOOD CALL OR A BAD CALL? In Driven by Health with Care’s Pressure In Care edition I reported on the massive variances in local supply levels of care home beds for older people. In my fourth annual report SAY HELLO, WAVE GOODBYE 2018 I once again showed that supply is falling, demand is growing, and closures are outstripping openings by 2 to 1. But more worryingly, beds have been lost in areas where they were needed, and there are openings where there are already enough. 78 out of 150 Local Authorities lost beds, 40% of which were already under-supplied. 36 Local Authorities gained beds, with 22 of them already over supplied. So, it seems that developers, and indeed Local Authority planning departments, continue to ignore supply and demand levels around new build locations, and open them where the market does not need them, with the obvious negative impact on all concerned. The economics of supply and demand state that too much supply leads to reduced occupancy levels. So, to prove or disprove this for the care home sector, I have built a case study based on two openings from 2018, that were chosen because, from the data I hold, were located in areas where one is under supplied, and the other very much over supplied. I will not go into specifics of the homes, other than one was opened in the West Midlands, one in the North East; both homes were in land-locked areas and predominantly urban. I used CSI’s MIDAS market model to analyse the supply and demand situation within a 5-mile radius (78 square miles) around each location. For this purpose, I have called the home in the undersupplied area Good-Call care home, and the other Bad-Call care home. Within the 5-mile radius the home there was a prime target population of around 48,500. The area is currently supplied by 86 care homes, between them having a total of 3,600 beds. This works out at 74 beds for every 1,000 prime target population. Within this 5-mile radius, whilst there are less homes and beds than Good-Call’s area – 61 homes, and just over 3,000 beds, they also had a far smaller target market – just 23,000 people. So, that equates to 133 beds for every 1,000 prime target population. Across England, where other industry commentators suggest average occupancy levels of just under 90%, there are currently an average 83 beds per ‘000 75 plus population. 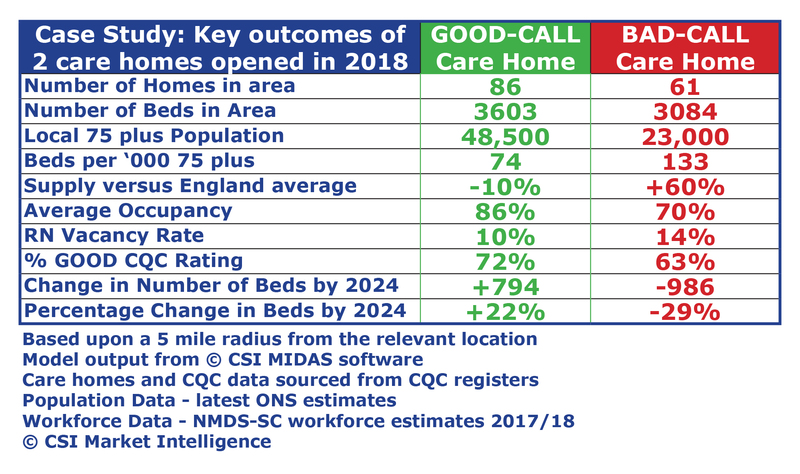 This means Good-Call’s area is around 10% under supplied in relationship to the national average, whilst Bad-Call found itself in an area with 60% higher than average beds. I analysed the occupancy levels at the time of homes in both areas that had a CQC inspection during 2018. The CQC always report how many residents are in the homes at the time of the inspection. No surprises to find that average occupancy levels around Good-Call was 86%, whilst around Bad-Call was only 70%. Additionally, I found that the homes with the lowest occupancy were the larger ones, built over the last couple of years. And do lower occupancy levels – with so many empty beds, and therefore lost income to spend on human resource, does this mean poorer care quality? In this particular case-study it does. Whilst 72% of care homes in Good-Call have a good rating, only 63% have achieved this in Bad-Call. But will increased demand over the coming years eat up the current over supply for Bad-Call? No. Without any new builds in the area, and the increased demand created by forecast growth of the 75 plus population, in 5 years-time it will need a reduction of around nearly 1,000 beds, or for around 18 homes to close, just to get down to current national average supply levels. I imagine it will not be a case of “voluntary closures to help the local marketplace”, as business pressures will probably drive the closures. I have checked and there are (luckily) no care home applications in the planning department, but who knows in the future if we are not going to control the situation. And where Good-Call is located? It could still do with more beds currently and requires a 22% increase in care home beds over the next 5 years to cater for population growth. I know where I would prefer to build. You?